Voulez-vous sous vide avec moi, ce soir? 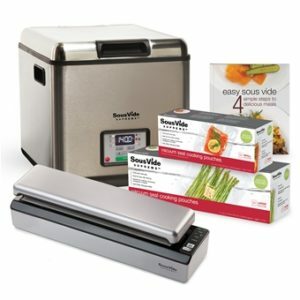 That’s the question of the night for those who want to whip up a romantic Valentine’s Day dinner on this day of love, as the SousVide Supreme takes center stage as one of the hottest Valentine’s Day gifts for foodies. 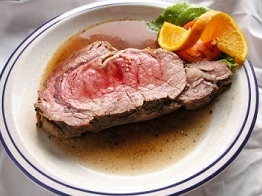 To help plan the perfect day, SousVide Supreme compiled the following sous vide Valentine’s Day menu including Rosemary Beef Rib Roast, Sage Carrots, Strawberries & Cream and a Raspberry-Infused Cocktail. Fill and preheat the SousVide Supreme to 134F/56C. Mix the garlic, salt, pepper, and rosemary together and sprinkle the mixture evenly over the surface of the meat. Drizzle the olive oil over the surface. Put the roast into a large (gallon/3.8 liter) food-grade cooking pouch and vacuum seal. Fully submerge the pouch in the water oven and cook for 8 to 10 hours. Sear the meat to caramelize the surface, either in the clarified butter in a very hot skillet or by brushing the surface with the clarified butter and searing under the broiler or with a kitchen torch. In a small skillet over medium heat, melt the butter, bacon fat. Add the sage leaves and sauté for 5 minutes; stir in the salt and cook an additional 5 minutes. Remove the sage leaves. 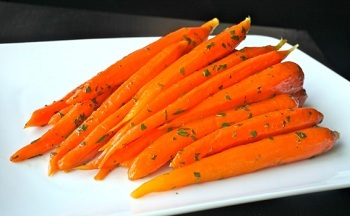 Toss the carrots in the seasoned butter, put them into a cooking pouch in a even layer, pour in any residual melted butter, and vacuum seal. Submerge the pouch in the water oven and cook for 1 hour. Remove from the pouch and serve. Preheat SousVide Supreme to 185F/85C. Remove the green leafy stem from the top of the strawberry and cut the berries into quarters, lengthwise, from stem end to tip. In a medium bowl, toss the berries with the sugar to thoroughly coat them. Submerge the pouch in the water bath, using the universal pouch rack to keep the strawberries below the water surface, and cook for 15 minutes. 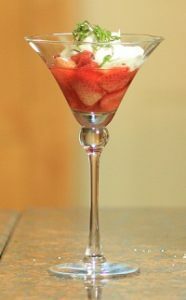 To serve, fill a martini glass or dessert dish two-thirds full with berries and top with a dollop of fresh whipped cream and a sprig of fresh mint.